Fraud is typically triggered by what is called the fraud triangle. The fraud triangle is financial pressure, a rationalization for the act and the opportunity to commit fraud. The current economic environment creates desperate situations for people and it is the organization’s responsibility to have systems in place to protect both the organization – as well as the employee. A good employee put in an uncontrolled environment might do things they would not ordinarily do because of external pressures. Definition of what fraud is – you may be surprised that many employees don’t understand the term. Zero tolerance for fraudulent behavior – emphasize that one time and you are out. How an investigation would be done – describe in detail what the process would like and how it would impact an employee’s privacy, reputation and employment. Consequences – immediate termination – employees need to understand that there is no begging for forgiveness. Outcome of fraud – prosecution – help employees understand the sober impact of their behaviors. The best way to help employees and managers understand a fraud policy is to do a formal training on the policy. The policy should be updated annually and incorporated into the new employee orientation process. Helping employees understand the organization’s commitment to protecting its assets is a great deterrent of possible fraudulent behavior. Provide a mechanism to monitor organizational goals. There should be a clearly defined process to investigate questionable behaviors and/or financial information. Defining the process ahead of time allows for a more timely and efficient investigation. It is never good practice to designate a single person to pay bills and monitor bank statements. Assign at least two people responsibility for paying bills and looking at bank statements. Require monthly reporting, and read the reports! Make it easy for employees to report something that is questionable. 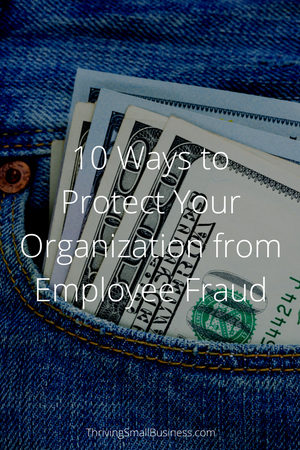 The more simple (and confidential) the process, the more likely it will be for employees to make the organization aware of suspect fraudulent activities. Taking time away from the office is not only good for employee morale but it is also good for the organization. Make sure that every position, with even a remote access to cash or assets, has a trained back up. Add to your employee policies a requirement to take the minimal allowed PTO time away from work. Pay attention if someone is resisting this request or hesitates from training a back up for their job. Incorporate the use of a safe for all cash as part of your internal controls. Require those who handle cash to use the two person rule for handling cash transactions and have a safe with a drop box to allow for a limited number of people to have access to the safe combination. Once an internal control process is created, make sure you review and audit it at least annually. Talk to employees who use it and spend some time to refine and improve the process for the organization. Who has access to accounting system? Is there more than one person involved in all accounting processes? Are all supplies accounted for? Is there a process to recognize supply shrinkage? Does the company owner review monthly bank statements? Finally, it is the responsibility of the board and senior management to ensure the organization is protected against fraud. Having good internal controls and consistent auditing processes can help to eliminate the opportunity of fraud within your organization. What do you do to protect your organization against fraud? Check out The Corporate Fraud Handbook to help with next steps! Great basic information in reference to small business fraud.